When most people think of horned oak galls, they visualize the gnarled, woody stem galls that form on the twigs and small branches of pin oaks. This is understandable since the gall-making wasp, Callirhytis cornigera (Family Cynipidae) that's responsible for directing the growth of the stem galls spends 33 months developing inside individual chambers within these very obvious galls. The galls grow larger in size with each season. In early spring, as the immature wasps near the completion of their development, the whitish-tan, cone-shaped “horns” that give this gall its common name begin to extend from the gall. The tiny wasps that emerge from the horns are all females and they are very poor fliers. This is the "asexual" generation because the females do not require mating with males to produce viable eggs. What's often overlooked (literally) is the handiwork of the females that issue forth from the stem galls. They crawl or fly (feebly) to leaf buds where they lay eggs to induce the formation of the leaf gall generation; they cannot prompt the development of stem galls. Yes, alternating generations of the so-called horned oak gall wasps actually produce two entirely different types of galls on different parts to the tree. The bean-shaped leaf galls are light green to yellowish-green and are found on the underside of leaves sprouting from the sides of the leaf veins. They are very small because they only house a single wasp larva. The larvae require around 3 months to complete their development. Male and female wasps emerge from the leaf galls; this is the "sexual generation," and they are very good flyers. Once mated, the females fly to small stems where they lay eggs to induce the development of stem galls from the meristematic cambial cells. The alternating of sexual and asexual reproduction between generations is a condition called heterogamy. Look closely on the underside of the leaves of a pin oak sporting horned oak stem galls. The leaf galls may be difficult to detect and given their insignificant appearance, it's hard to imagine that these diminutive growths are the source for the generation of wasps that are responsible for producing the highly conspicuous, and sometimes destructive, woody stem galls. 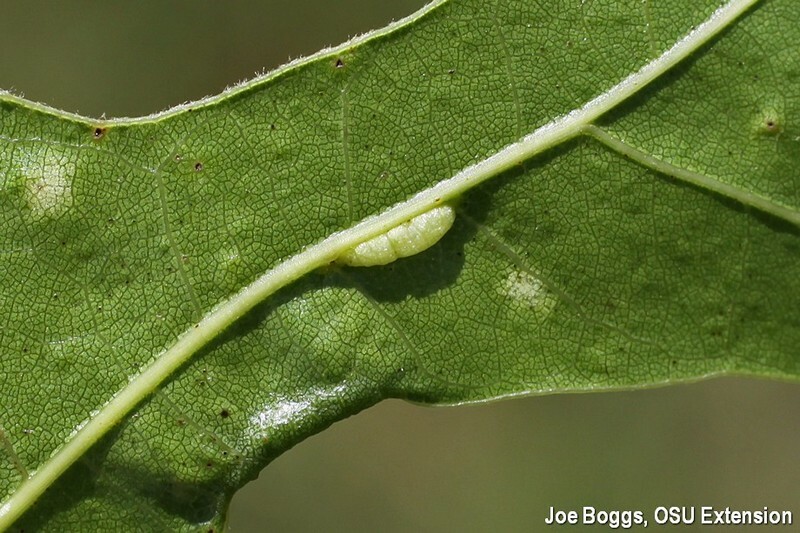 Management strategies for the horned oak gall wasp must take into account the two locations where the gall-maker resides. Adding to the complexity is that nothing is synchronized. Leaf galls occur every year providing a constant stream of wasps producing new stem galls. The annual reservoir of wasps streaming from the leaf galls that are dedicated to producing stem galls would make trying to manage horned oak gall by pruning out galled stems a never-ending process.